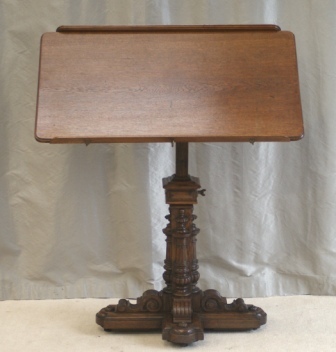 An Antique Oak Reading Table or Lectern. Gothic styling, French markings to mechanism ("Brevet" = Patent). Full working order. Table elevates on a sprung mechanism (to full standing height) and also slides from side to side. In addition the table top can be be rotated front to back. Magnificent carved column. Original brass wheels and fittings. Suitable for use as a reading table, music stand, lectern, drawing table or as a display stand for art work. A fine oak Reading Table or Lectern. Probably French in origin. Mechanisms in full working order.